Now comes the really picturesque part of our Italian trip. 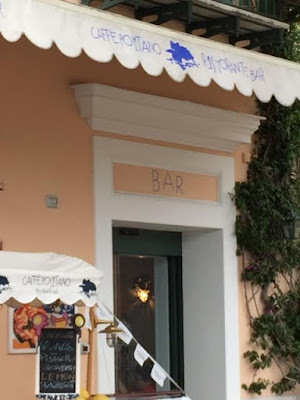 (If you need to get caught up, here are Part 1 and Part 2 of "Rosy the Reviewer Does Italy"). Now don't get me wrong. Sorrento was lovely and we thoroughly enjoyed it. 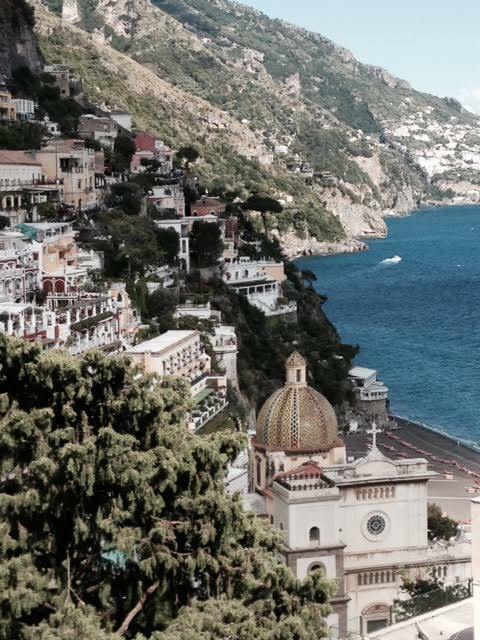 But Positano and the Amalfi Coast are something special. 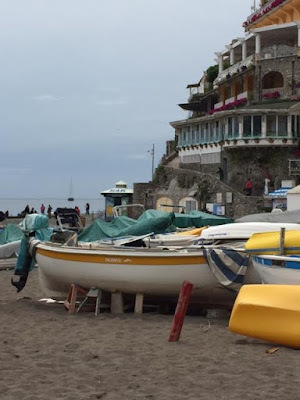 The Amalfi Coast is a stretch of Mediterranean coastline in Southern Italy that is known as a playground for the rich and famous, especially in the 1970's. 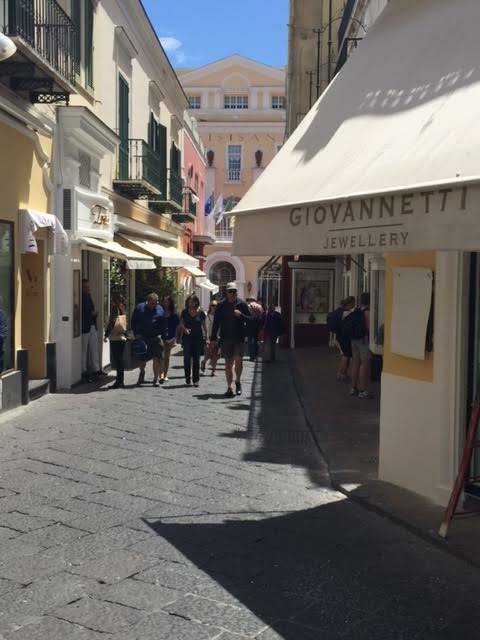 Peter O'Toole was a frequent visitor to Positano after falling in love with it while filming the remake of "Goodbye Mr. Chips" in 1969. 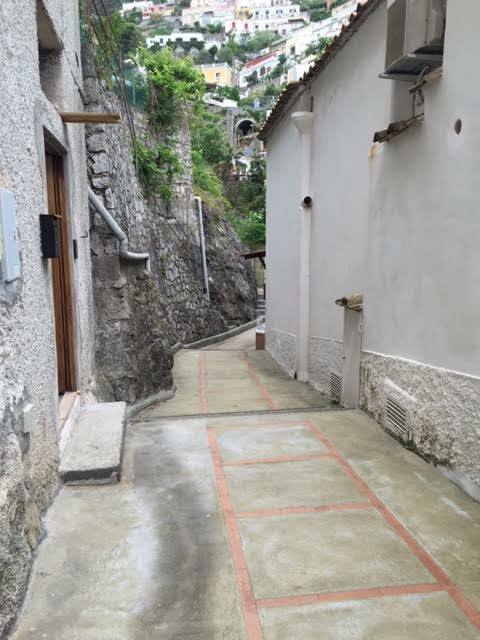 Gore Vidal left the U.S. to live full time in Ravello. 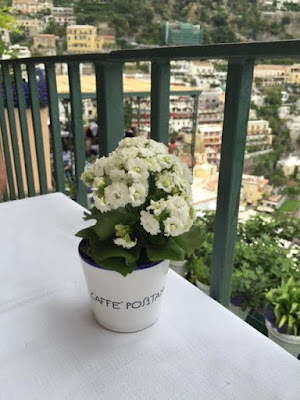 And even today, I just finished Andy Cohen's "diary" and he has a long entry about a recent trip to Positano. 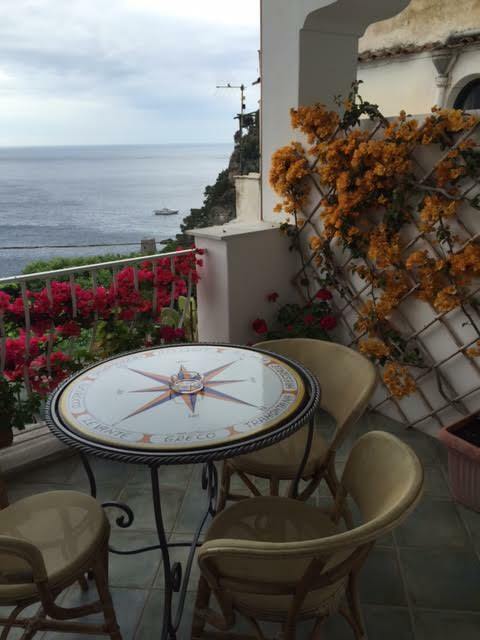 There is a reason why the Amalfi Coast attracts the rich and famous. But it's not an easy place to get to for those of us who are not the rich and famous. I can imagine those folks going in on their yachts but for us regular folks, it's bus or taxi or renting a car. 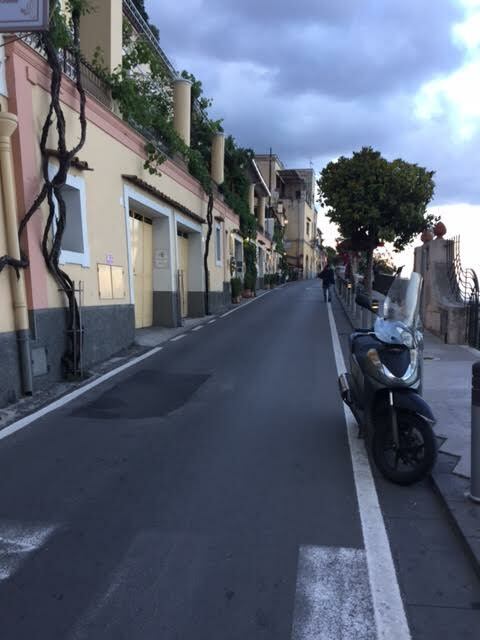 Good old travel writer Rick Steves had put the fear in us about driving the winding road with the sheer cliffs between Sorrento and Positano ourselves. Even if we wanted to drive it, one of us would have to watch the road (Hubby) and so would miss the views. We could have taken the bus, but the staff at our hotel said if we didn't want to stand the whole way, we should catch the bus at the train station. The train station was a long haul from our hotel and with our luggage? No way. So, the bus did not appeal and we thought a taxi would cost too much. 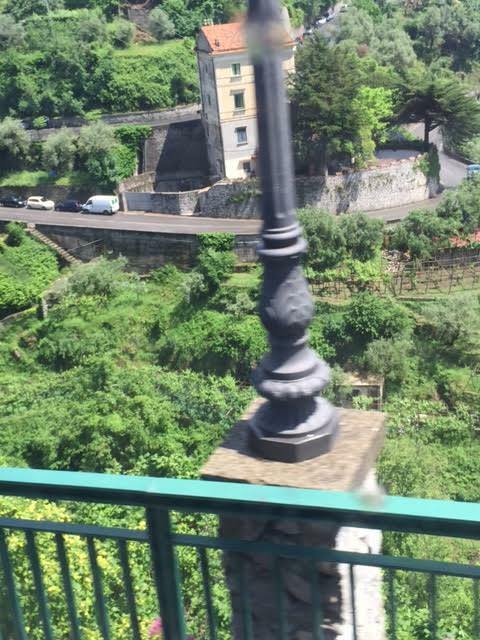 If you remember from last week's post, we paid 23 euro for a taxi to just take us up a hill in Sorrento. So Hubby had the bright idea of hiring a private car. 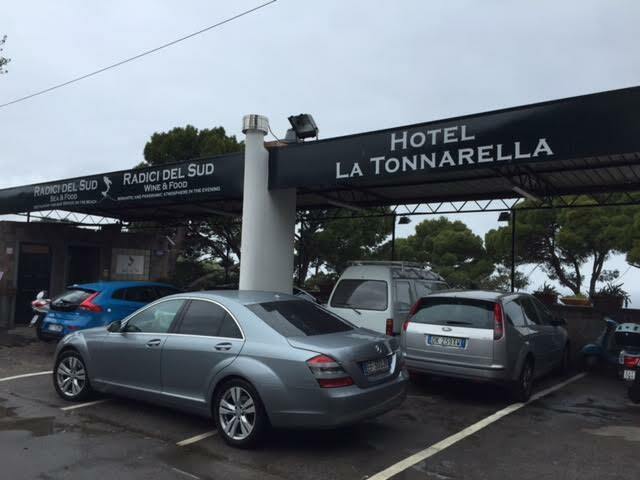 We inquired at the hotel and yes, such an option was available through them for 70 euro. Since it cost us 23 euro to ride up that hill in a taxi in Sorrento, we thought this was a deal. So we arranged to be met at 10am the next morning. Right at 10am a lovely Mercedes awaited us with a driver who spoke some English. Tip #1: Don't be cheap. I can't emphasize enough the importance of this tip. When traveling abroad, often a trip you may never do again, counting your pennies is not recommended. If it's the difference between sitting in comfort and seeing the gorgeous coastline or navigating a treacherous road yourself and missing most of it, money should not be the first priority. And then there's the whole issue of your wife bitching about how cheap you are the whole ride. But that's a different story. We sat in luxurious comfort in the back of the Mercedes sedan. Hubby even remarked later how much fun it was for him to just sit and relax while being driven around. I told him to not get any ideas. 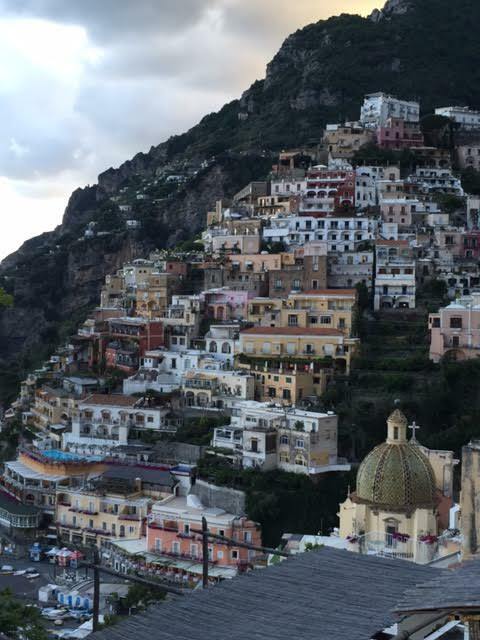 Our driver asked if we wanted the "panoramico" drive? "Si." Unfortunately, the weather was not cooperating with "panoramico." Coastlines and fog go together like a horse and carriage. Living on the Central Coast of California for over 30 years, we were used to the unpredictability of coastal fog so accepted the fact that the Italian coastline must deal with it as well. But all was not lost. 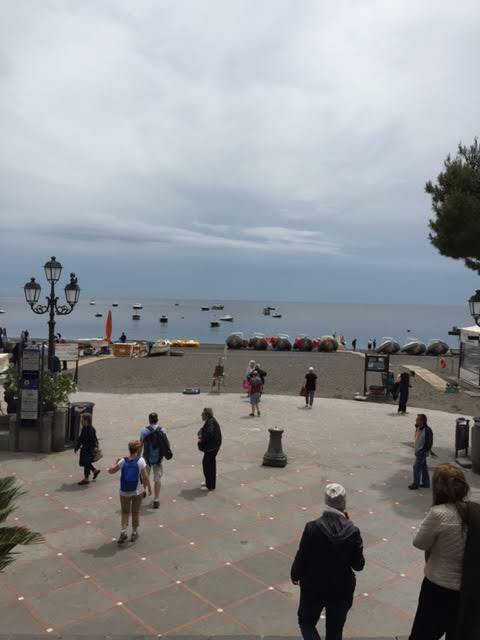 As we neared Positano, it cleared somewhat and we could still enjoy the vistas. 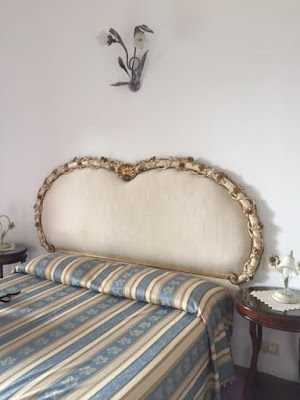 We also planned to go on to the town of Amalfi in a few days which would take us further along the coastline and afford us another opportunity. Tip #2: Try to be positive, even when the weather is not cooperating and your wife is sighing deeply and saying "Why us?" 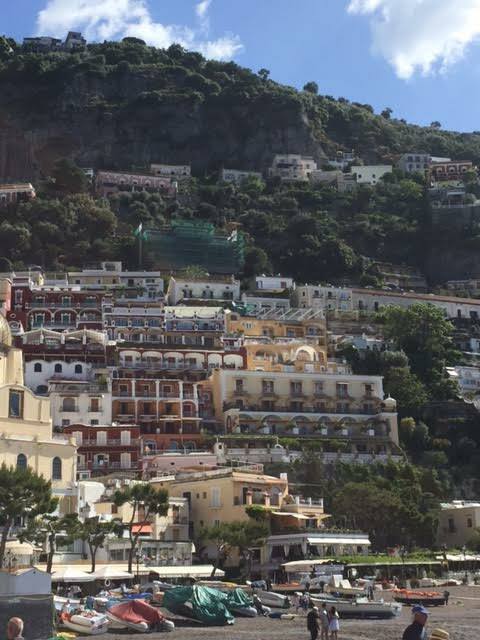 As we neared Positano, our driver asked for the phone number of the hotel. We were not sure why he wanted that, but when we arrived, someone from the hotel was waiting for us on the road to carry our luggage to the hotel. Did I mention the stairs? 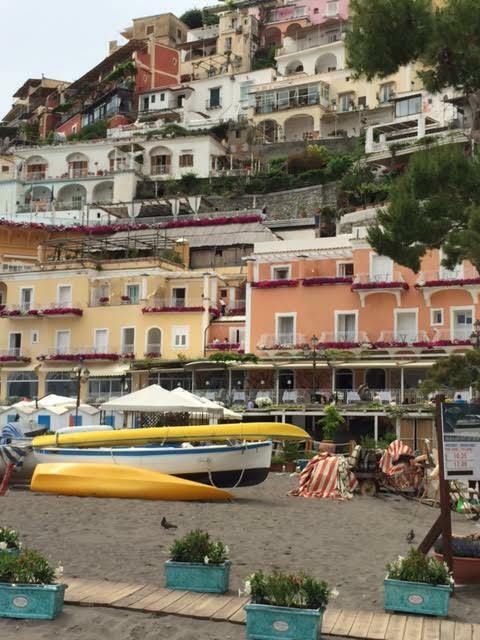 Positano is a town built into a cliff overlooking the Mediterranean Sea. The entire town is nothing but stairs except for one street that winds it's way through town. 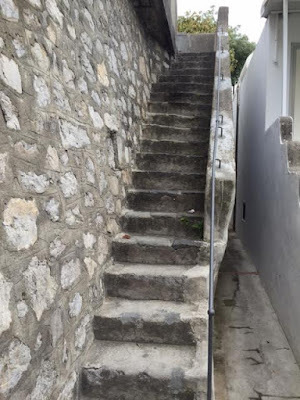 If your hotel happens to be down at the beach or far from the road, you would have to carry your luggage up and down stairs for a long, long way. We didn't even think about that or that someone would meet us to carry our bags. Tip #3: Hiring a local driver has its perks. We were happy to have a member of the hotel staff meet us and carry our luggage because, as usual, I was wearing unsuitable shoes and we might have had problems finding our hotel within the rabbit warren of paths. Our room was ready when we arrived and it was a lovely room with a large terrace overlooking the Mediterranean. The room also had those lovely Italian tiles I have come to enjoy. And breakfast served on the terrace. I can SO get used to this! 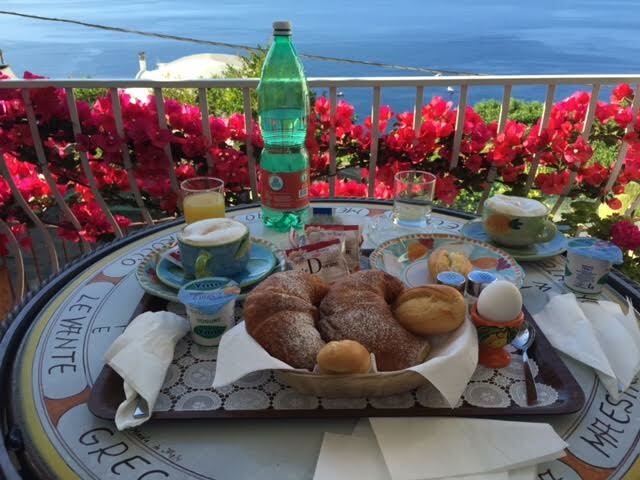 The Italian breakfast: assorted roles and cappuccino, and if requested, a hard boiled egg and some yogurt. Perfetto! We had made plans to meet my Swedish cousin, Jane, and her husband, Lars. 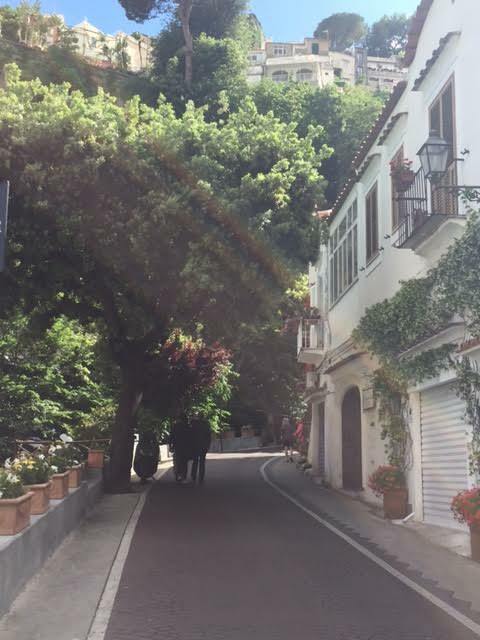 They were driving to Positano from Rome and wouldn't be coming in until the evening so we decided to take a walk and do some exploring. 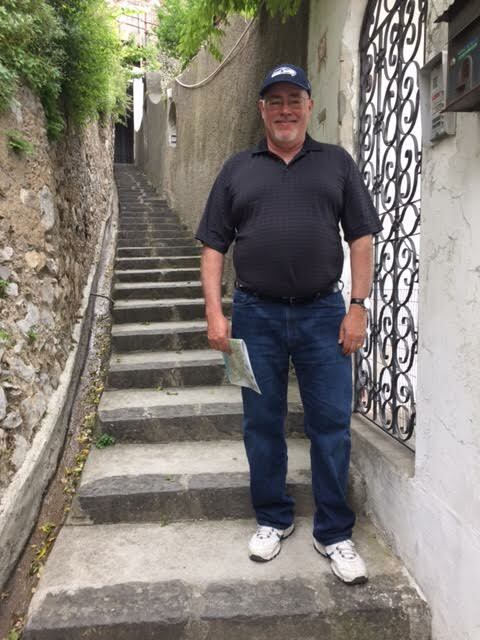 Did I mention there were stairs? After all of those stairs, time to get some lunch at the Café Positano. Did I mention how cheap wine is in Italy? In most of Europe the wine and beer are cheap and cocktails expensive. 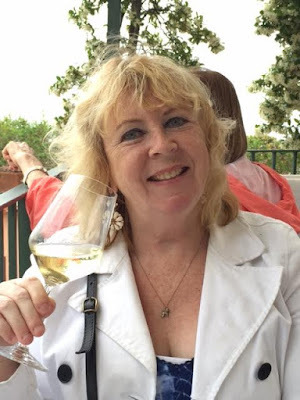 Wine was cheaper than the bottled water! Tip #4: Drink lots of wine. We struck up a conversation with a young couple who were sitting near us. They were on their honeymoon. Tip #5: Don't be afraid to start conversations with strangers. You can share travel tips and you might just make some new friends (more on them later). Jane and Lars had booked their hotel before us and when Hubby tried to get a room where they were staying, the hotel was already booked. Tip #6: For popular destinations, book your hotel as early as you can, especially if you are using guidebook recommendations. But Hubby is a resourceful fellow and using Google Earth found a hotel only a few steps from theirs. 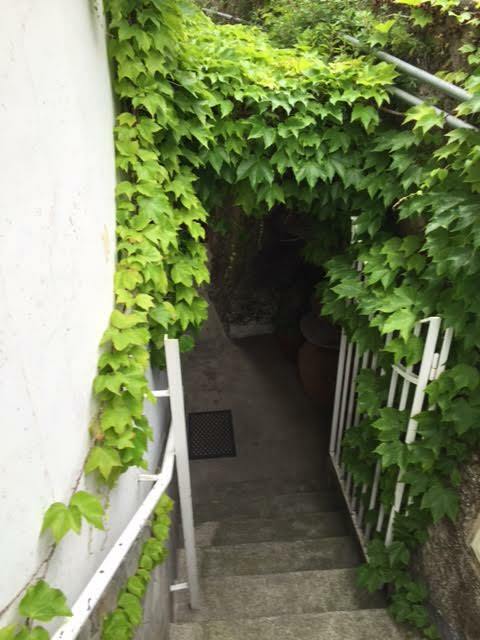 And as it turned out, their hotel put them in an annex -- and the annex was right next door to us! 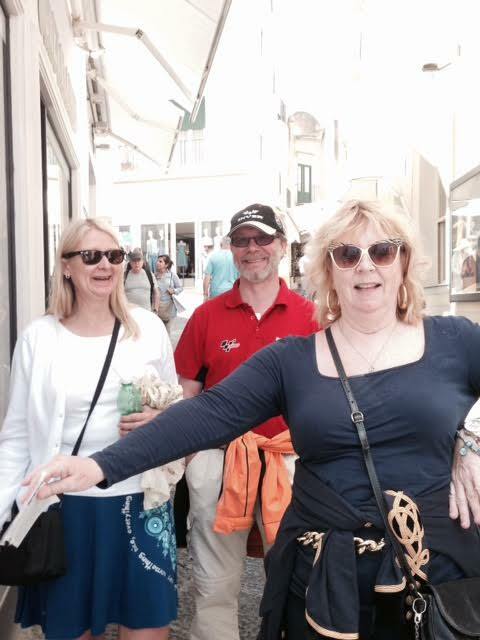 We have started a tradition of sorts, of meeting up with Jane and Lars every couple of years when we travel to Europe. The last time we met them was in Amsterdam two years ago and we had a great time. 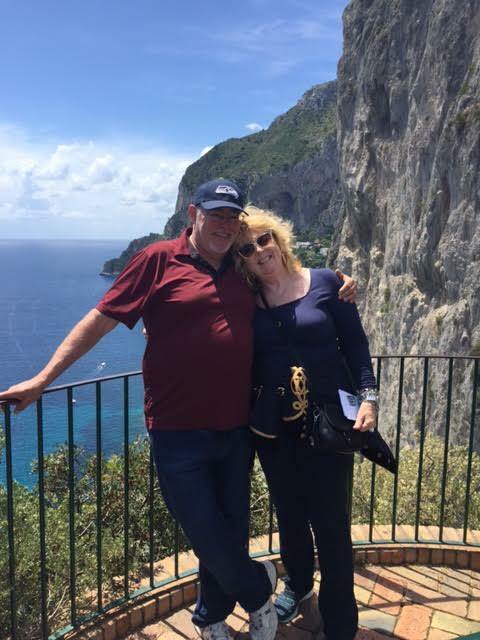 Jane and Lars are wonderful traveling companions. They are generous, considerate, up for anything, and positive no matter what happens. Tip #7: Choose traveling companions who are generous, considerate, up for anything, and positive no matter what happens! After getting caught up at dinner, we sat out on our terrace planning our next couple of days together. 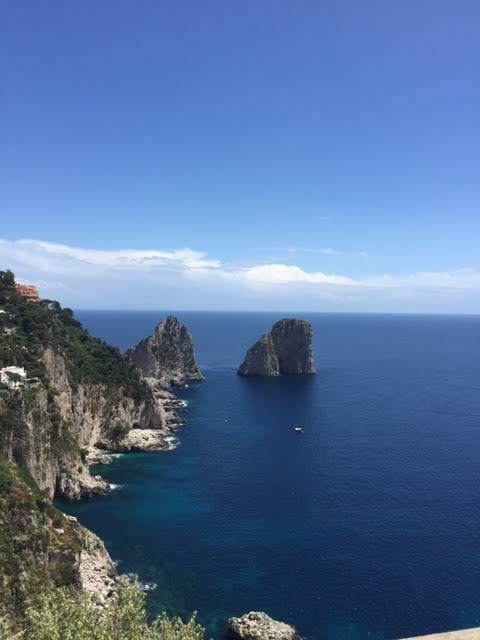 We planned to sail to the island of Capri the next day and take the bus to Ravello and Amalfi the day after that. 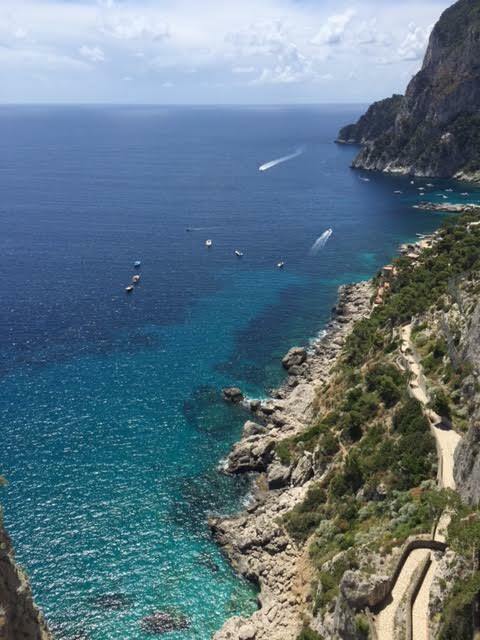 Here is the first thing you need to know about Capri: it's pronounced KAH-pree. Second thing: it's crowded as hell even in May. Did I already say that May is no longer a particularly good time to travel? It was very convenient that boats traveled to Capri right from Positano. That was the good news. The bad news was I found the ride rather harrowing. Huge storm clouds were gathering overhead and the boat captain must have been in a hurry because he didn't seem to think that heading straight into the waves was a bad idea. We crashed into the waves like a lead basketball. Where's that cheap wine when you need it? 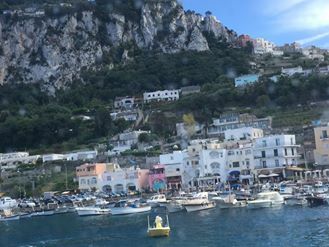 Capri is a small island - only four miles by two miles - with two small towns: Capri and Anacapri, both up the hill from the boat dock. To get to Capri you can take a taxi or the funicular and Anacapri is even farther up the hill. 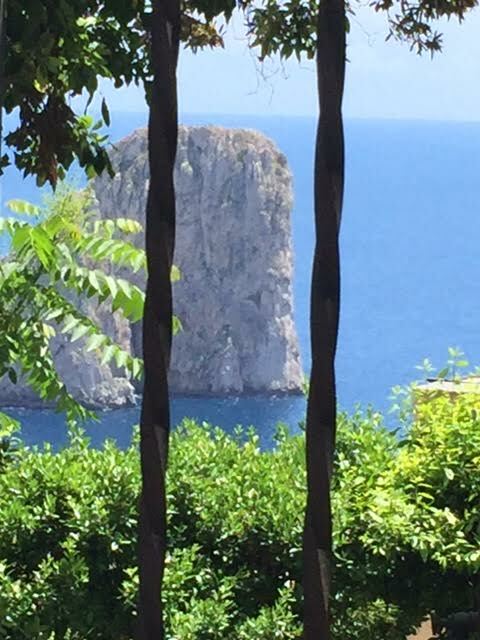 But the big draw is the famous Blue Grotto. 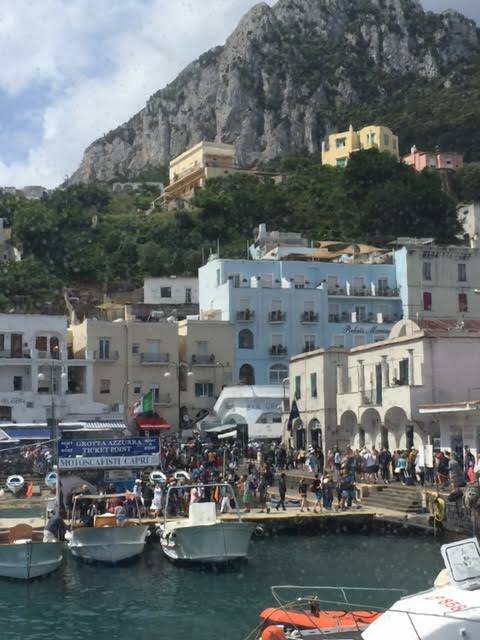 The guidebooks recommend that you do the Blue Grotto as soon as you arrive, because it requires that you take a boat to the other side of the island and then you have to get into a little rowboat to be taken into the grotto. And weather is an issue. And it was for us that day. It was closed. Boo. Disappointment #1. 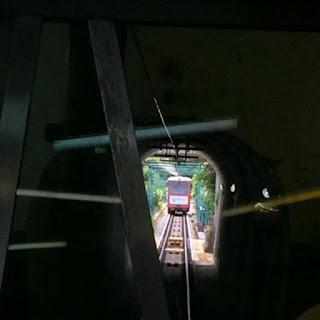 So we headed across the square for the funicular along with a thousand other folks. The funicular could only hold 70 people at a time so it was a long wait. And you had to stand in line at another location to buy tickets. 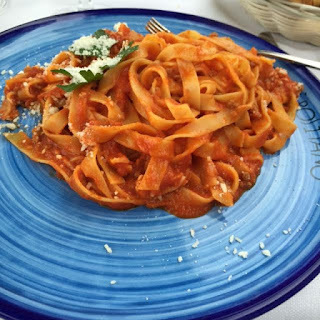 When we eventually made our way up the hill to Capri, it was time for lunch. We stopped for lunch and then explored the town. 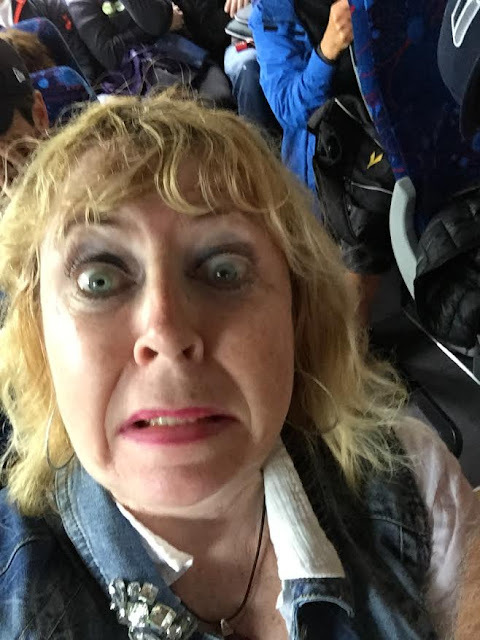 Since I feel strongly about keeping a low profile when I am traveling and trying to blend in as a local, I am not sure what I am doing here, but it appears to amuse Jane and Lars. 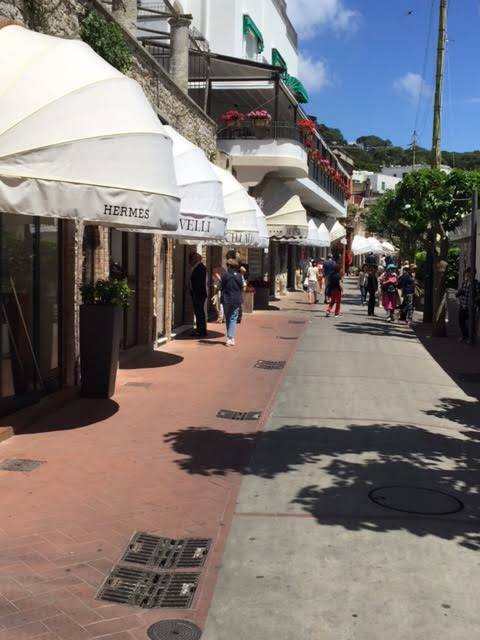 One of the streets is nicknamed "Rodeo Drive," because of it's many high-end shops. Hubby kept me moving. (speaking of "to die," I thought I was going to die on that damn boat trip to get here)! It is also a very romantic place. 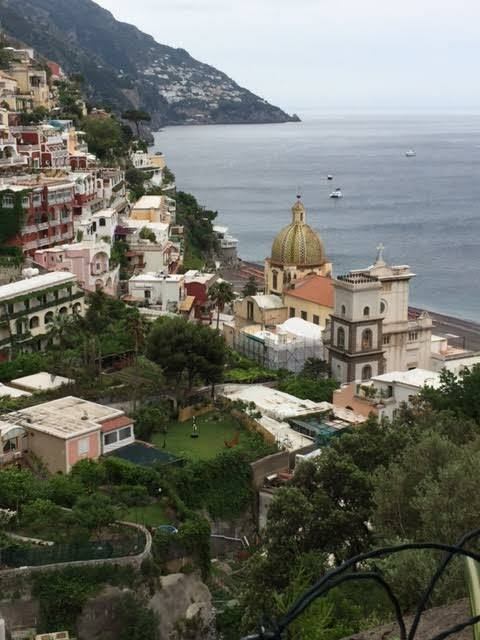 We could have spent more time in Capri, but decided to catch the 3 o'clock boat back to Positano and beat those storm clouds. 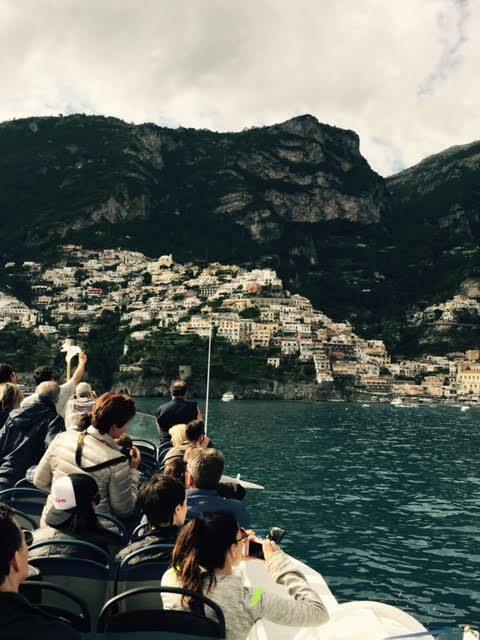 This time there were some young men passing out shots of Limoncello on the boat. Hubby in his ever trusting and naïve way thought the shots were free but I was already pulling the euros out of my purse before he discovered they were NOT free. Tip #8: Nothing is ever free. However, I needed that shot for the journey back so well worth the 3 euros each. 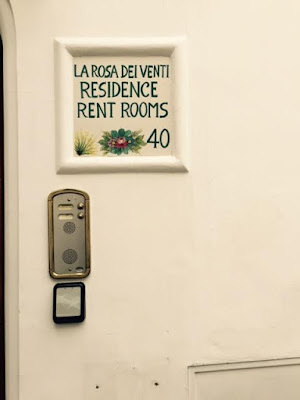 When we arrived back at Positano, we all went back to our respective hotels to freshen up. 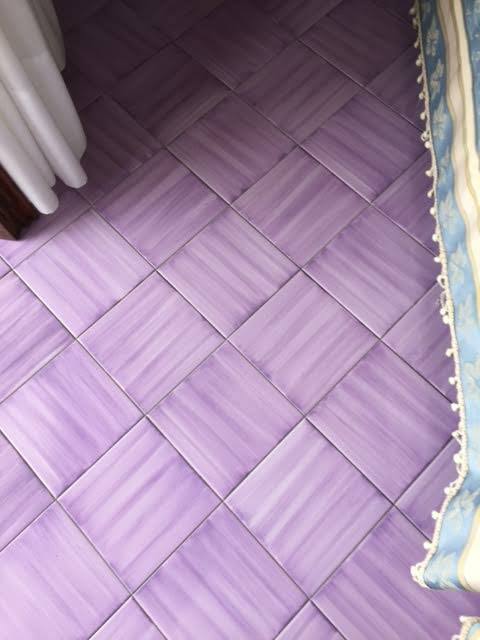 Tip #9: When traveling, take some breaks back at your hotel from time to time to regroup. That way you can maintain your energy throughout the evening and enjoy that hotel room you are paying for. Remember that young couple we met the day before at lunch? 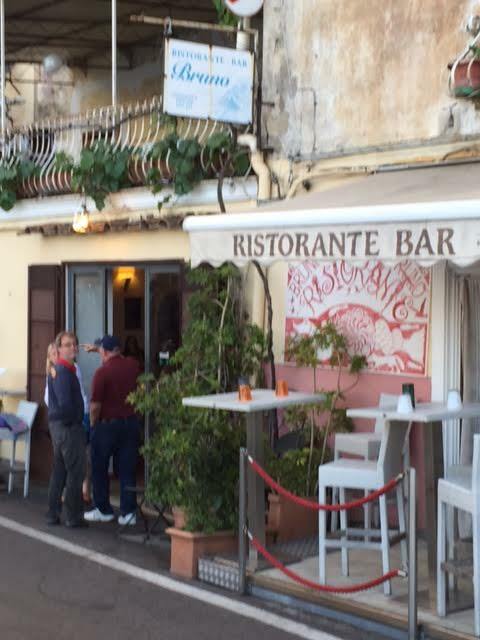 They had recommended a restaurant to us so that's where we headed for dinner: Ristorante Bruno, known for its seafood. Turns out Rick Steves had also recommended it so it was crowded but after a short wait we shared a delicious meal, and later in the evening back at Jane and Lars' hotel room, we sat out on the terrace and listened to music. 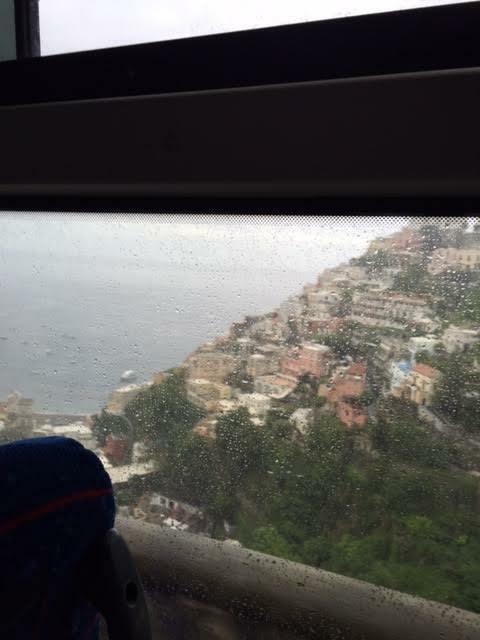 The next day was a bit rainy but we walked up the hill to catch the bus to Amalfi and then on to Ravello. 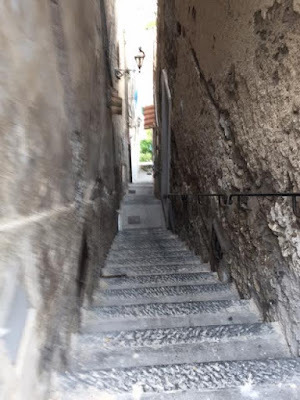 I wanted to see Ravello because that is where Gore Vidal had lived and there was also a stair walk I wanted to do - to walk down the hill from Ravello to Amalfi. But first we had to ride the bus. Now let me just say there are bus rides and then there are bus rides. The bus drivers who drive the Amalfi Coast are amazing and must have nerves of steel. They maneuver their large buses around blind corners, squeezing by oncoming traffic in all kinds of original ways, all the while avoiding sliding off the side of the cliff. 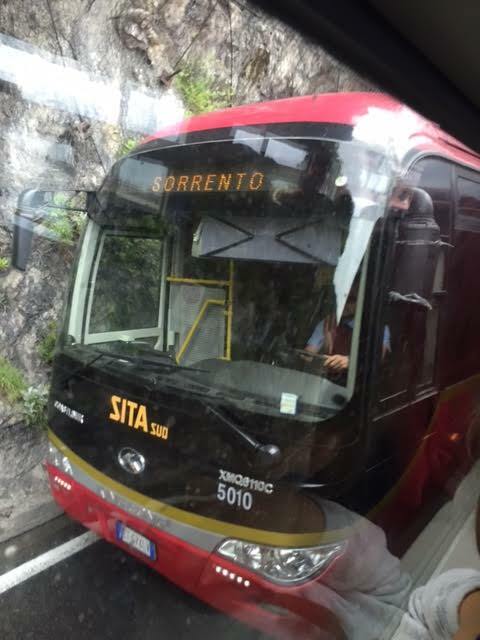 Tour buses are only allowed to go in one direction, but the local SITA buses go in both directions so buses encounter each other at every turn. And lest you think me a complete wimp, let me explain what is happening here. That bus you see in the picture. We are NOT in that bus. We are in a bus GOING THE OTHER WAY INCHES FROM IT! 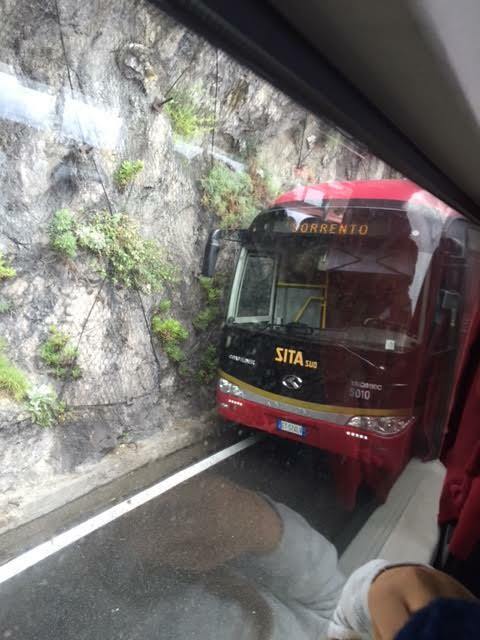 The buses cling to the cliff and the riders cling to each other. Because it's a long way down. I found God many times on that bus ride. 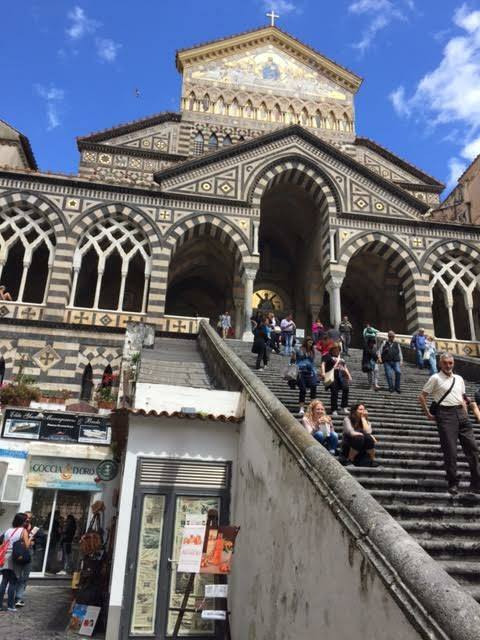 We changed buses in Amalfi and made our way up to Ravello. 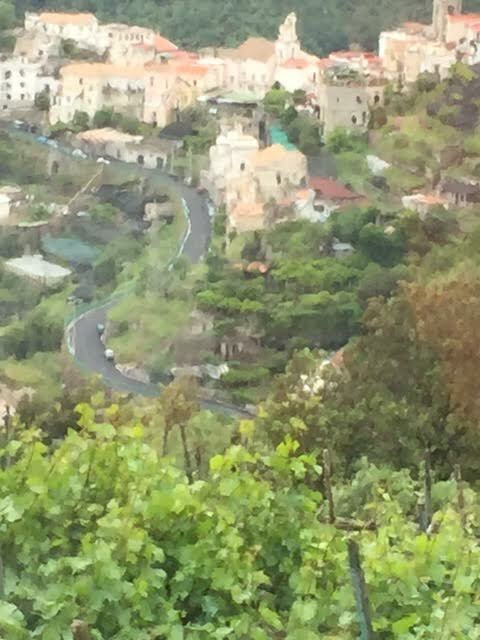 There is not a whole lot going on in Ravello. 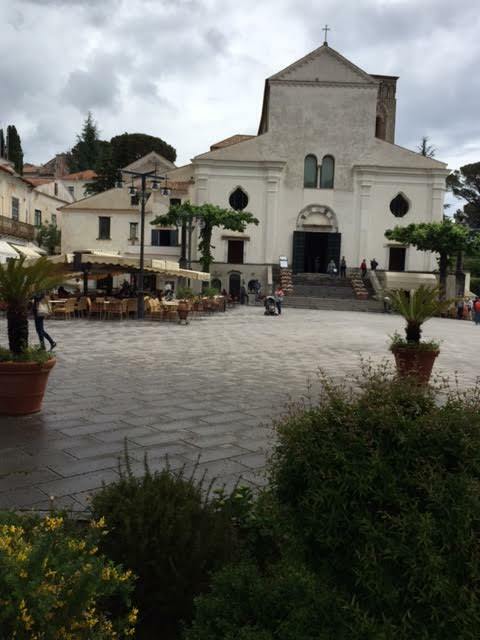 There is a lovely little square with a church. But there are also two villas with lovely gardens and views. 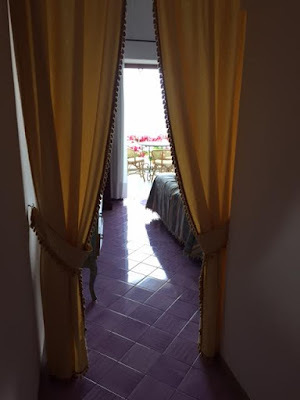 But just as we arrived at the Villa Cimbrone, it began to pour. We tried to wait it out but it just continued to pour, dashing our hopes of not only seeing the gardens and its views, but of taking that stair walk down the hill that I wanted to take. Boo! Disappointment #2. While waiting under a canopy for the rain to stop, we ran into that young couple again. They had just finished checking out the gardens before the rain started so we could find out what we missed! 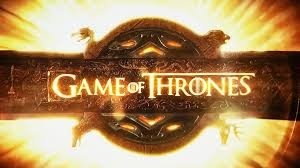 Speaking of what we missed. 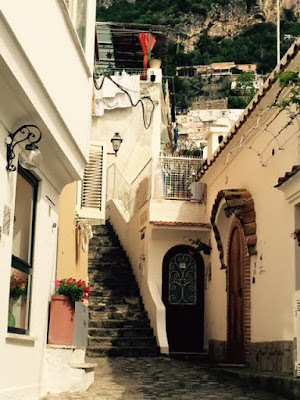 We just missed the bus back down to Amalfi so what do you think we did to while away the time? We carefully watched the time and gave ourselves a 15-minute window to get up and get back to the bus and it's a good thing we did. The next bus left early. We barely made it. 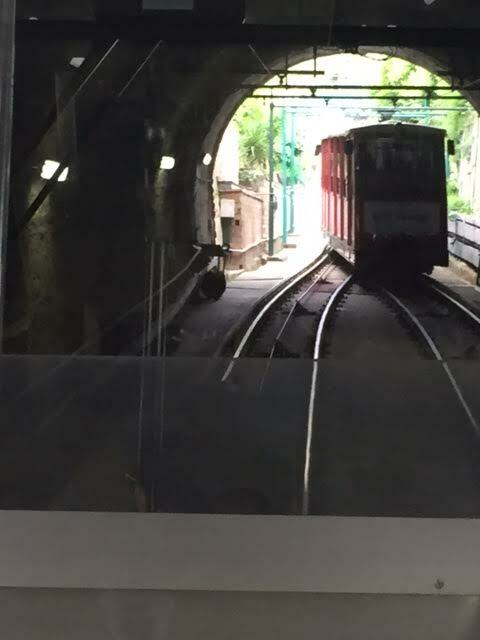 Tip #10: The trains may run on time in Italy but it seems the buses arrive and leave whenever they feel like it so plan accordingly. when all of a sudden the front doors swung open, and a priest entered followed by a coffin carried by pall bearers. A funeral was in progress and we were now a part of village life. 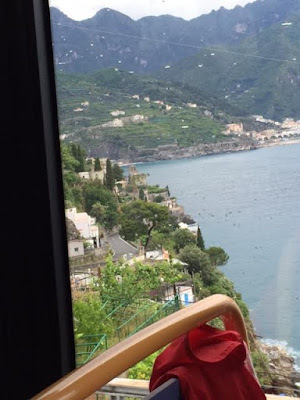 We thought a boat ride back to Positano would be quicker and less frightening than the bus (even though I was still a bit boat shy since Capri), and it was. That night we had a delightful dinner at another restaurant recommended by that young couple (see what striking up a conversation with you nearby dinner lunch companions can do?) - Next2. Hubby was impressed that the restaurant had Knob Creek whiskey. After dinner we took a stroll but decided because it was our last night together, we wanted to hang out. 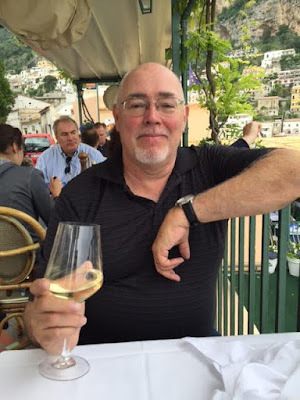 Hubby now had a taste for some good American whiskey and so we tried a couple of places, none of which had acceptable whiskey and none of which seemed to want our business so back to Next2 we went where we kept the poor waiters after hours. 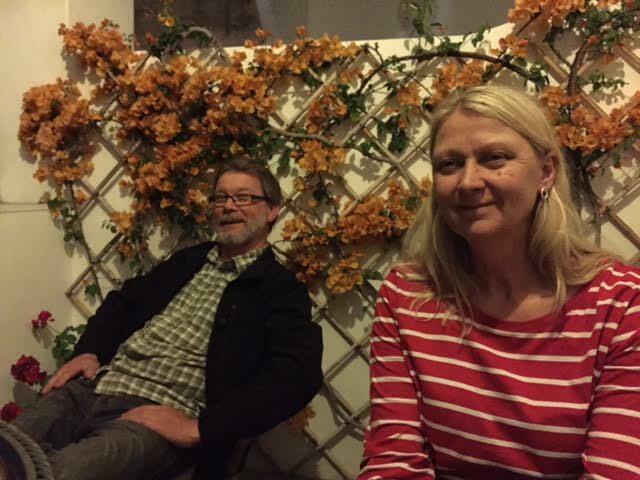 The next day Lars and Jane drove us back to Naples via Sorrento where we had lunch under some lemon trees at the Café Latino. 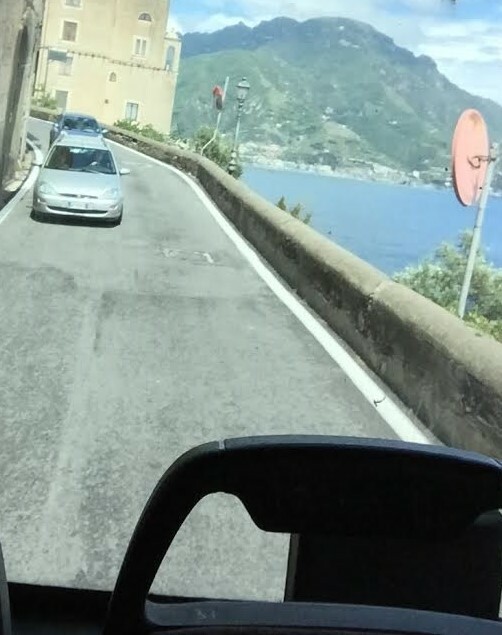 Lars ably drove the winding roads from Positano and managed the crazy traffic that is Naples with Jane and the Swedish Garmin navigating from the back seat. We said our goodbyes, vowing to meet up again in a couple of years - Ireland? Scotland? France? 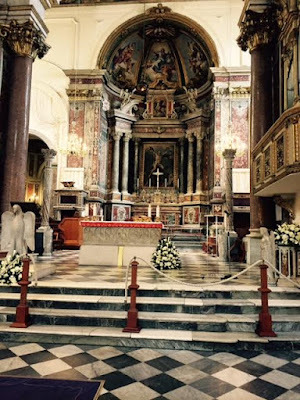 The next day we took the fast train from Naples back to Rome, spent another night in Rome in the Trastevere and then flew home. 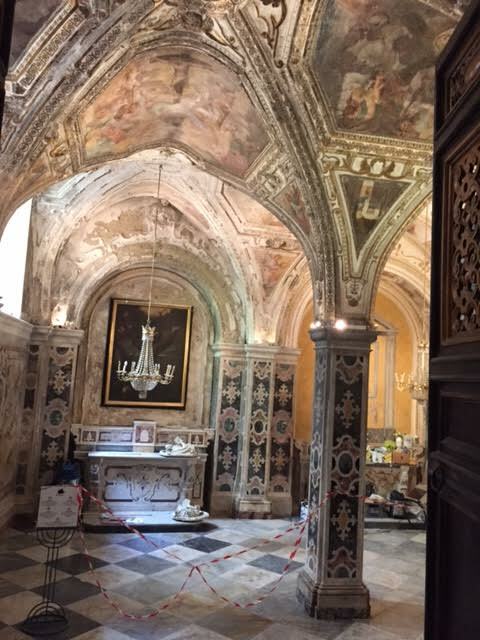 Why did we spend another night in Naples instead of heading back to Rome with Jane and Lars? Ask Hubby. 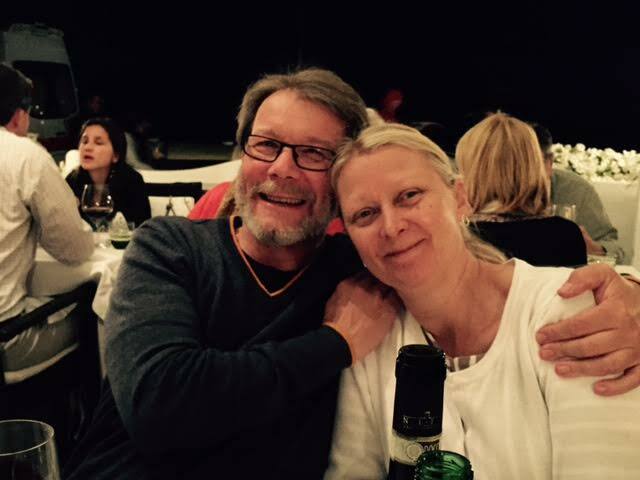 I liked everything, especially sharing it with good friends, Jane and Lars. 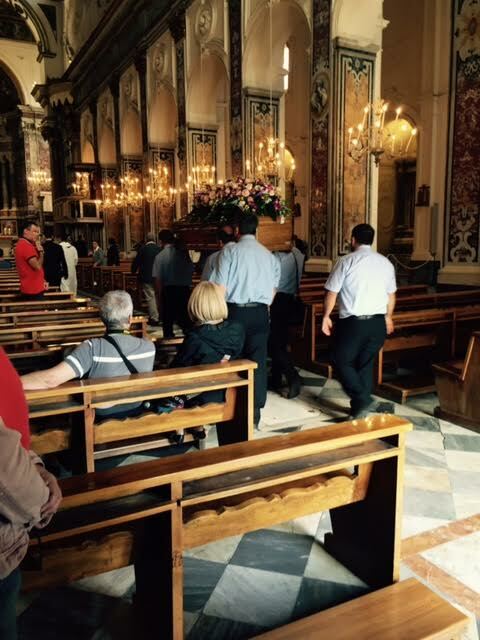 And that my dear readers was our trip to Italy. let's all keep on traveling."